My alarm was installed by another alarm company. Can you monitor this alarm? Yes we can. 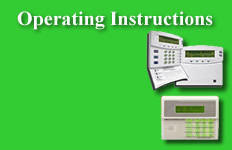 Many times, it involves simply re-programming your existing equipment. In some cases, we have to change the alarm panel. In the majority of situations, we are able to re-use all of the detection devices. Call us for an evaluation. My power is off and my alarm is beeping. What should I do? Simply enter your code. This will silence most trouble conditions. If this doesn't work, call us. We can usually "walk you through the repair". If not, we'll schedule a service call. As much as we would like to quote a price over the phone, it is very difficult because of differences in construction and the size of the installation. Usually, we need to see the extent of the work involved and the equipment required to protect your home or business in order to determine an accurate price. We have been in the alarm business since 1989. ABC Security was founded in 1995. In most homes and businesses, we can complete the installation in one day. We show up in the morning, and your home or business is secure by night. Are your systems wired or wireless? We try to install wired systems, but in some cases it is impossible to get a corded wire to a certain area. In this case, we would use a wireless device. Will I see the wires? No. We pull the wires inside the walls and either through the attic or crawl space to the alarm panel. I am building a new home. Is it better to pre-wire for an alarm or wait until construction is finished to have an alarm installed? It is always much better to have your home (or business) pre-wired, because the detection equipment can be more effectively placed for operation and appearance. My alarm has a backup battery. How often should it be replaced? The systems we install monitor the condition of the battery. The keypad will usually beep to alert the owner of a low battery condition. Batteries typically last 2 - 4 years. Who services my alarm when something goes wrong? We do. We're a small company, and you'll see the same people service your alarm that performed the original installation.